You probably know already, but for those that don't I will explain. A backlink is an incoming link from one website to another. So, any page that links to a page on another website is adding a backlink to that destination page. A key point is that it is only a backlink when the link is between websites. Any link within a website is called an internal link. Backlinks are valuable because they are how a website becomes part of the internet. With backlinks people can find you, and so can search engines. Many search engines also use backlinks in their algorithms as a way to determine ranking. Google rose to dominance because if its use of backlinks to rank results using the PageRank algorithm. Discovering and analysing backlinks to a website can be very valuable. I made a BackLink Analysis Presentation in 2013 which highlights several ways to analyse and use this data. However, discovering backlinks is not an easy task as it requires a deep crawl of the internet. This is why several services are now available to provide us with that data. This article compares some of the most popular ones. There was a big panic in the SEO world when Yahoo announced at the end of 2011 that they were going to discontinue their Yahoo Site Explorer. Where would all these SEOs get their data for those monthly reports! I was more relaxed because I've been using several backlink tools for a long time. I believe the more sources I use, the more complete my data is. And as it turns out, it's also good risk management. I did not panic, but it did make me re-look at my software. I have my own free backlink checker that pulls in data from several sources. I though this would be a great opportunity to generate some tool comparison data. So, I enhanced it to support a few more sources and to generate reports for this article. My backlink software also validates every discovered link by crawling the backlinking pages and checking if there is still a link on them and that the link goes to a valid page. So this report not only compares how big an index a tool might have, but also how accurate it is. Here are the backlink tools that were included in the analysis. As you can see I managed to gather data before Yahoo shut up shop, so we can see how important it was (or not). I have categorised each tool as Public (anyone can gather data for a domain), Private (only for webmasters of a domain) and Paid (you pay to get data for a domain). 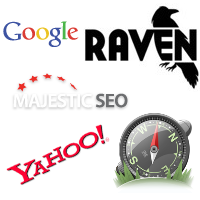 Majestic SEO provides it's data for webmasters but also offers paid access to other peoples domains. It is also the source of data for Raven SEO Tools. As I did not get a complete set of data for Majestic SEO I have decided to exclude it from the stats. From the data that was gathered it seemed that Raven would sometimes return only 10% of the data provided by Majestic SEO (Historic), indicating that Majestic SEO may be a far more complete source. I gathered data from 11 websites of varying size. While a few websites exceeded Google's 10,000 backlink limit most had less than 500 backlinks. In no way is this a large data set to provide conclusive evidence, but it is enough to see patterns. About 130,000 backlinks were found covering 8,000 domains. Of those I managed to validate about 60% of the backlinks. Raven SEO Tools scores very well here however in reality the Google Search Console (Google Webmaster Tools) generally scores better. Raven won this race Because of the 10,000 limit in the Google Search Console. To highlight the effect, the following graph excludes the larger websites. This means the Google Search Console is great for domains with less than 10,000 backlinks. Any more and Raven SEO Tools starts to shine. I've been sampling the 10,000 limited Google Search Console data for a while and something I noticed is that Google periodically rotates the data it returns. Maybe every week or so. This means that the sample set can get more complete over time. For the public options Yahoo Site Explorer was the best source. You people not prepared to pay will miss it. It actually did better on the smaller websites dues it's 1,000 link limit that restricted it's performance for the larger websites. The Google Search Console came out strong here even with its 10k limit. The reason for this is Google tends to provide its sample from across all the domains. So the domain count remains high but the number of backlinks per domain drops. 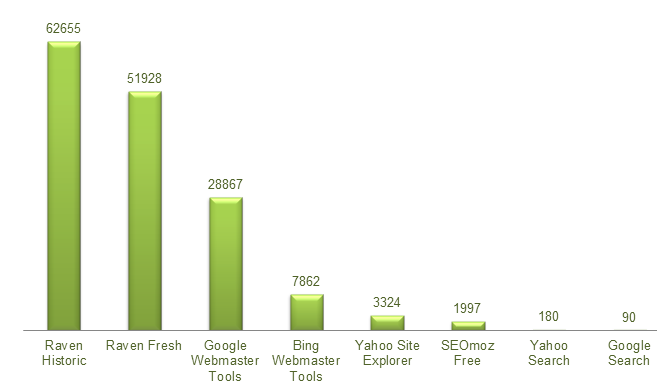 SEOmoz performed stronger at the domain level and almost equalled Yahoo Site Explorer. Here I have limited the data to just include the pages I managed to validate (a hunt for a direct link in the page). It seems to show that Google's index is more accurate than Ravens and as expected Ravens Fresh data was more accurate than the Historic data. Here Google steamed ahead in the race, even with its 10k limit. If you're the webmaster with Private access then about 24% of the links are only available to you. This is mainly due to the Google Search Console. If you only have Public access then you will only see about 2% of all the links. This was about 4% when Yahoo Site Explorer was working. Quite a loss for those relying on public access alone. Yahoo Site Explorer was the only source for 1% of the links. This leaves us with Paid access which can get you 73% of the links found. That's a good chunk of data for your money. Blekko was excluded because there was no way to expert the data. SEOMoz Pro was excluded because I didn't pay for it :-O Non of the tested domains reached 1,000 backlinks which may mean that the Pro would have not made any difference. SEO Spy Glass provides 1,100 links for free. 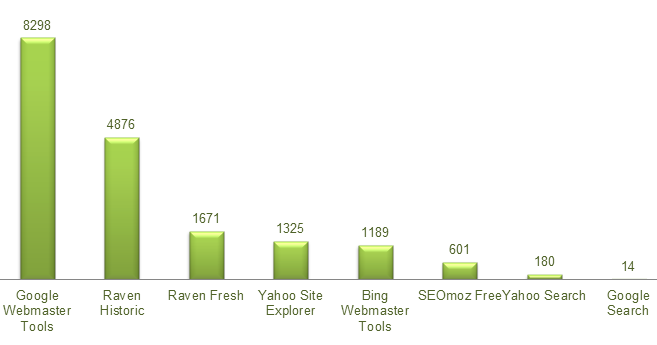 From a basic test the results looked very similar to Yahoo Site Explorer or SEOmoz Open Site Explorer. Back Link Watch does not provide a download option so was not tested. Result counts looked similar to Yahoo Site Explorer. aHrefs looks like it has similar data levels to Majestic SEO Fresh but they state they do their own crawling. Only limited data is provided for free. Traffic Travis just used public Google and Yahoo search results. So not really a player. Market Samurai now uses Majestic SEO (fresh or historic). I think you have to pay Majestic SEO for it to work. SEO Profiler requires payment but sample data showed potential. If you are the webmaster then it's a no brainer to register your website with Google Webmaster Tools to get around 75% of the available link data. While your at it, register with Majestic SEO and Bing. If your not a webmaster or want to get closer to 100% then you really need to pay. Majestic SEO is the main source I tested. 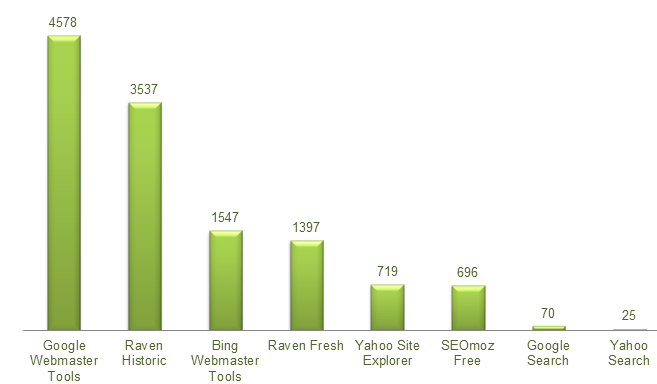 If you access Majestic SEO data via other tools like Raven SEO Tools you may find you see less links, but still a lot! Otherwise, SEOmoz and Open Site Explorer is your best free option. Don't sweat the loss of Yahoo Site Explorer. It only provided 1% of unique data.